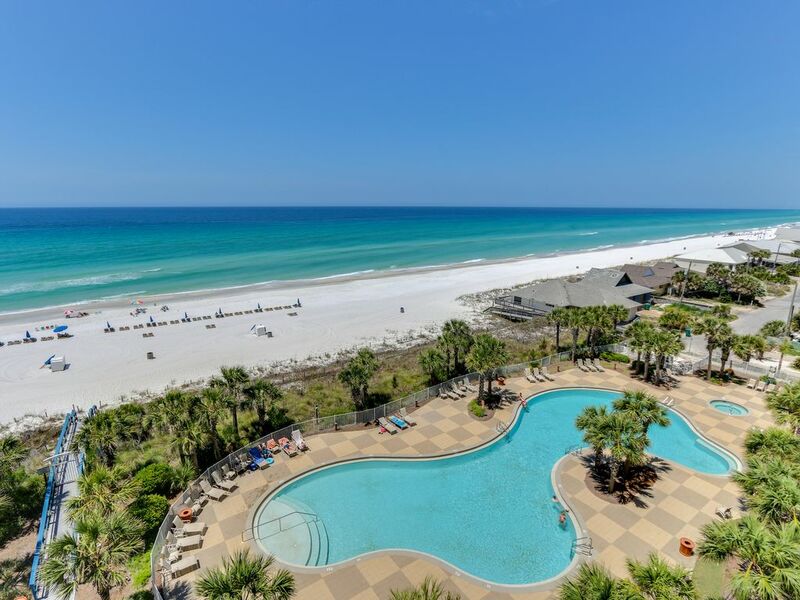 Sterling Beach Resort is one of the Emerald Coast's newest and most luxurious condominiums. Residing on a quiet part of Thomas Drive, Sterling Beach enjoys over 300 beautiful feet of beach directly on the Gulf! This high end condominium has it all! From serene mornings at the beach, fun days around the free form tropical pool, hot tub and grill area, afternoon cocktails with extraordinary Gulf views on your own private balcony, or romantic sunset walks along the waters edge! Relax and cuddle up around the TV to watch a movie, or enjoy local attractions, cuisine, shopping, theaters and night life! This spacious upscale unit has all the amenities of luxury living away from home. Decorated in a West Indies style the master is furnished with a king bed, whirlpool bath, separate shower, double marble vanities and a direct Gulf front view. The living room is beautifully decorated with plush leather furniture, as well as a 65' LED 4k TV and cable. The dining area seats six with room for more at the breakfast bar / kitchen counter. The large fully equipped kitchen has all the appliances of home, Corian countertops, plus anything you would need to prepare a feast and dine in. The second bedroom is decorated with a nautical theme painted a beautiful sky-blue and equipped with a queen-sized bed. Our calender is ACCURATE and UP TO DATE! Our rates beach chair service for two!! Tom is an airline pilot and Melanie is pediatric pharmacist that writes for a medical reference company. We have two young girls (9 and 10 years) who love the condo and beach. Our dogs Franklin and Walter have not been even though they jump in the car when we head over. We chose to purchase a vacation home at Sterling Beach for one simple reason: LOCATION! It's in a quiet section of Thomas Drive & right on the beach. It's easy enough to get to all the attractions but not so close that they intrude on one's quiet time. The unit itself is large, almost 1500' under air, ten foot ceilings, over sized balcony, professionally painted and decorated. The condo complex is private, well landscaped both in the front as well as the pool area with pavers, grill area, gym overlooking the pool, and a theater / meeting area. Local attractions include child friendly events (go-carts, water slides, putt putt golf, fishing, beach, movies) as well as adult friendly areas (golf, dining, fishing, wave runners). Wheelchair accessible with wide hallway. Bathrooms are not set up as wheelchair accessible. high speed internet, 65" Vizio LED 4k, TV/stereo/CD/DVD player with cable and true surround sound, completely outfitted kitchen, fresh linens, full sized Washer & Dryer in unit, jetted tub in Master Bath, free form heated pool, full sized gym, 48 seat private theater w/surround sound, state of the art private meeting room, Non-Smoking unit and no pets. We have found our PCB home away from home. Beautiful condo! Very modern and spacious! We have found our go to condo for this area and will definitely be staying here again. The owner,Tom, couldn’t have been more pleasant and professional to work with. Top notch experience all the way around! The condo was beautiful, extra clean, and the property manager was very friendly and accommodating. Will be back! We had a wonderful time staying in this condo. It is beautifully decorated and had everything we needed. The kitchen is fully stocked with any cooking supplies you might need, including Tupperware containers if you have leftovers. The property is located in a great area on a quieter stretch of the beach. It was close enough to easily drive to places to eat and shop within minutes, but far enough away that traffic/noise was not an issue. There were even several places to eat that you could walk to in a few minutes. On one side of the property there are a few houses instead of a large complex, so that really cut down on the number of people on this area of the beach. The property office even has a stash of books that have been left that you can borrow if you happen to go through yours too quickly. I would definitely recommend booking this condo! I enjoyed my this rental property. The property is very well located. Easy parking and entrance. Easy getting around to the beach, pool and fitness area. I would recommend this property to my friends. The property was really nice very spacious. Very nice size balcony overlooking the pool and beach. I could cook breakfast in the morning and look and see dolphins swimming outside. We had plenty of room for me and my 5 kids. My 9,6, and 4 yr olds loved the jacuzzi tub. I would highly recommend this unit. A refundable deposit of $300 is due at booking. The balance in due 15 days prior to arrival.